Property Location With a stay at St. Joseph Hotel in London (Kensington), you'll be convenient to Stamford Bridge Stadium and Natural History Museum. 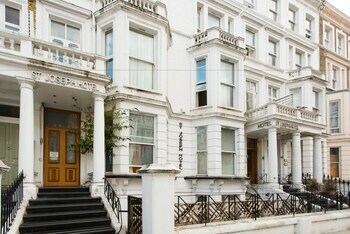 This hotel is within close proximity of Kensington Palace and London Science Museum. Rooms Make yourself at home in one of the 40 guestrooms. Wireless Internet access (surcharge) is available to keep you connected. Bathrooms have showers and hair dryers. Conveniences include safes, and cribs/infant beds (surcharge) can be requested. Dining A complimentary continental breakfast is served daily from 7:30 AM to 9:30 AM. some room types at this property are not available when booking a stay with children. Veuillez noter que certains types de chambre dans cet établissement ne sont pas disponibles en effectuant une réservation pour un séjour avec des enfants.